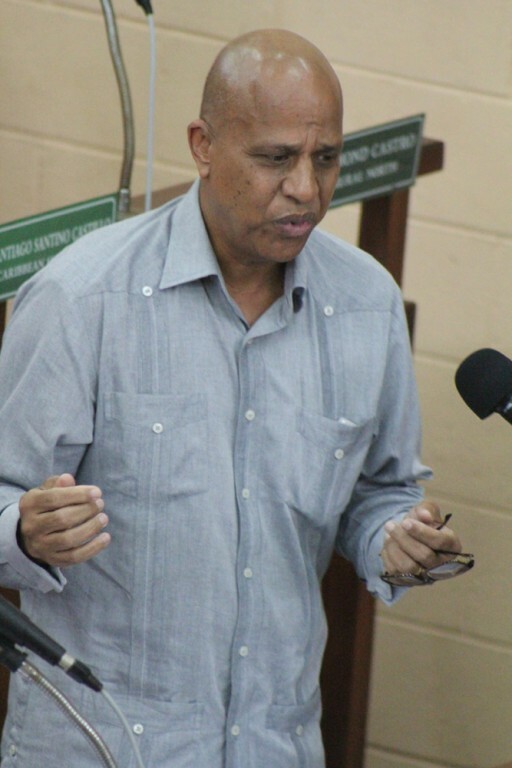 Prime Minister Dean Barrow and the United Democratic Party government continue to put their house in order for early general elections, slated for early next year, by negotiating a settlement to pay the former owners of Belize Telemedia Ltd (BTL) – US$81,088,899.70 or Bze$162.7 Million as partial compensation for government’s acquisition in the public interest of BTL shares in August 2009. Barrow presented a Bill which was rushed through all three readings at 10am, 12 noon and 3pm, and approved at a special sitting of the House of Representatives in Belmopan on Tuesday, September 15th, for an Act to compensate the former shareholders, and the Telecommunications Acquisition Settlement Act 2015. The settlement brings to an end six years of court battles between the government of Belize and the Ashcroft group, which had fought the acquisition tooth and nail, and won a victory in the Belize Court of Appeal, which had ruled in 2011 that GOB’s acquisition of BTL was unconstitutional and illegal. The Barrow administration found a way around this by passing an amendment to the Belize Constitution in 2011 requiring all public utilities to be controlled by the government and people of Belize. The Ashcroft group appealed the Belize courts’ decision to the Caribbean Court of Justice, but also began independent arbitration proceedings in the United Kingdom for compensation. The breakdown of payment is US$24,557,124.24 to be paid to Dunkeld, which held 71.2% shares in BTL through various holding companies. GOB bases compensation on the valuation done by NERA Economic Consulting - US$0.72 per share. Dunkeld owned 34,107,117 shares. GOB will also pay US$7,986,848 to the Trustees of the BTL Employees Trust for 11,092,844 shares, also at the NERA valuation: US$0.72 per share; for the 23 per cent shares which the BTL Employees Trust owned through its holding company, Sunshine Holding Limited. Both payments to Dunkeld and BTL Employees Trust will come from the sale of BTL shares in 2010, monies which were held on deposit while the matter remained in litigation. At Monday’s press conference at the Biltmore Hotel in Belize City, Barrow admitted this US$32.5 Million payment - $65.3 Million Belize dollars is only partial payment of compensation for the shares, as the matter is still in arbitration. GOB has always accepted that it must pay the former BTL owners for their shares, but had valued the shares at Bze$1.44 per share; while the Ashcroft group claimed the shares were worth closer to Bze$10 per share. More than half that Bze$162 Million settlement is $97.4 Million Belize dollars (US$48,544,927.78) which the U.K. arbitration tribunal ruled in December 2014 that BTL (and its new owners – GOB) must pay the British Caribbean Bank (BCB) for a US$22.5 Million loan which BTL had borrowed from BCB. The Barrow government had reneged on repaying the loan when they took over BTL, deeming the loan as illegal. Few would have entered such a loan agreement, which was at 12% interest per annum, which grew to 16% if the loan went into default. Since GOB refused to pay, the arbitration panel deemed the loan was in default, and the 16% interest applied, so the debt grew to over US$48 Million. Barrow said GOB will pay off this debt in U.S. dollars now, but he also explained that since the debt is really BTL’s, the company will reimburse the government. For now, the money will come from dividends and contributions due from BTL; from the sale of additional Treasury Notes and from PetroCaribe funds. Barrow put on a brave face at Monday’s press conference as he swallowed this bitter pill, admitting that the government could have denied the arbitration ruling, and dragged out the legal battles for another four years in the local courts, but this would have only doubled the debt, if the ruling went against GOB. As Belize Telemedia chairman Nestor Vasquez Sr explained at the press conference, GOB had to take over BTL, because what existed was an unregulated monopoly. BTL had a secret accommodation agreement with the government which gave the company more authority in certain instances that the regulating body, the Public Utilities Commission. In effect Belizean customers were being treated to a puppet show, the illusion of competition in the telecom market between BTL and SMART Speednet, when in fact Barrow was able to prove that both companies were under control of the same owner, which made it a monopoly. The Opposition People’s United Party representatives voiced their objections to the Bill at Tuesday’s House session, but as former PUP Prime Minister George Price was known to say when the PUP held a 17-1 majority in the House, “the minority may have their say, but the majority will have it way”. By strange coincidence, Tuesday’s sitting was also occasion for the passing of a vestment bill for the transfer of the assets of First Caribbean Investment Bank (FCIB) in Belize, to the Heritage Bank, a business transaction between two private entities. For though it drew criticism and debate over how the Bill may affect the final compensation package of FCIB employees made redundant by the sale, it also reminded of another vestment bill of 2007, by which Belize Telecommunications Ltd, owned at the time by Jeffery Prosser, morphed into Belize Telemedia, when the Ashcroft group re-acquired Prosser’s controlling interest in BTL. The company was Prosser’s only money-making company, and he had been siphoning off cash to pay litigation for other telecom utilities he owned in other CARICOM territories. The cash-strapped Prosser was eventually forced to sell BTL back to its original owner, at less than favorable terms.